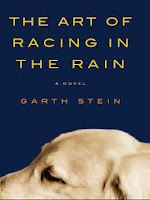 Stein's story of Denny Swift, a young man who aspires to drive race cars, while working on other people's expensive automobiles, gives a dog's eye view of Denny's early marriage, fatherhood, and grief. Enzo is no ordinary dog--or maybe he is. He manages to learn much from the television left on for company while his master is away. He watches racing footage with Denny. He even has his list of favorite actors (including at number five or six Peter Falk as Columbo). He is privy to private conversation, and he channels that sharp canine instinct, even senses the presence of disease long before it is diagnosed. If the successful formula for a novel is the cause trouble for your characters and then watch them try to get themselves out of trouble, Stein succeeds. In fact, while listening to the audiobook on my way to and from work, I found myself in a dark, anxious mood one day, only to stop and realize I was fretting over Denny's situation, not my own. Another reason the book works so well is the blend of the serious plot line with the clever humor. Enzo resents the human acceptance that monkeys are our closest animal kin simply because they have thumbs. As I've noted so many times, some books lend themselves well to audio--and this one did. The reader was pitch perfect. But heading off on a long car trip with my husband, who had not read the book, I opted to read the last few chapters in a real book. I still heard Enzo's voice. Stein's arrangement of the plot is skillful as well, using the present as a frame for most of the tale as flashback, providing the reader with the sense of dramatic irony from a number of angles. Not ony do we know what the dog knows, but we know from the beginning that this story will inevitably end as all lovely, sad dog stories do--and then Stein throws us a curve. As if I didn't have plenty of ways to fill my so-called spare time, I decided this semester to sign up for a photography class. Birthday before last, my husband gave me a nice camera, letting me advance beyond my usual point-and-shoot model, but for months, all I have known how to use was the automatic mode. I was determined to learn more--and I have. In the class, though, we have several assignments. Since I'm only auditing the class (knowing I could never attend every Saturday and not actually needing college credit), I probably don't technically have to complete the assignments, but being who I am--I will. We are to complete a photobook (something I love to do anyway), to frame and matt one 8X10 photo (aha! The grandkids are coming at the end of the month), to produce a slide show set to music (and oh boy! Do I have a great idea), and to write a paper on a famous photographer. Since I teach composition and research, the last part had me going at once. 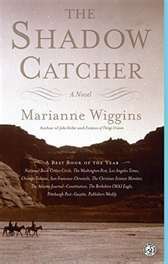 I thought of all the photography exhibits I've seen at museums--Annie Leibowitz, Steichen, Ansel Adams--and then I started reading Marianne Wiggins' The Shadow Catcher. Honestly, I don't know what to call the book. It's called a novel--and I would probably go ahead and call it a historical novel--loosely based on the life of Edward Curtis, famous for capturing iconic images of native Americans in the nineteenth century. But Wiggins weaves in her own story, relating a phone call she receives after pitching her completed story of Curtis to Hollywood producers: Her father was dying in a Las Vegas hospital. Her father, she knew, had committed suicide thirty years earlier, but the man in question had her father's identification--with her listed as next of kin. Intrigued, she goes there. I was drawn into the novel immediately because of Wiggins' treatment of the artist's viewpoint, beginning with her fascination with a map by DaVinci, one she realizes he shouldn't have been able to produce without an astronaut's perspective. Throughout the book, I was drawn to consider all the tensions in art--the tension between artists who work on canvas and the photographers they score, the tension between artistic photographers and amateurs content with inexpensive Kodak cameras. As the narrative moves back and forth between Curtis's story--and that of the wife he leave alone for longer and longer stretches as he pursued his photography career--and the author's story, eventually the thread are woven between the two. After completing the book, I'm not sure which parts are true now and which were invented for dramatic purposes. I'm not even sure I want to know. The author does thank her own sister in the credits for allowing her to use their family story, but she doesn't indicate how much is fabricated. I do know, though, that I will pursue the Edward Curtis story--either for my photography class or just for pure curiosity. Then maybe I'll move on to Steichen or Leibowitz or Adams. For twenty-four years now, Caldwell Community College and Technical Institute has hosted our Writers Symposium, now named to honor Laurette LePrevost. The list of writers who have appeared here is impressive--Maya Angelou, Ernest Gaines, Nikki Giovanni, to name a few. Some of our writers were featured before they "hit it big." We're excited to learn that Ron Rash's novel Serena, our campus reading selection two years ago, is about to become a major motion picture. We are not surprised. 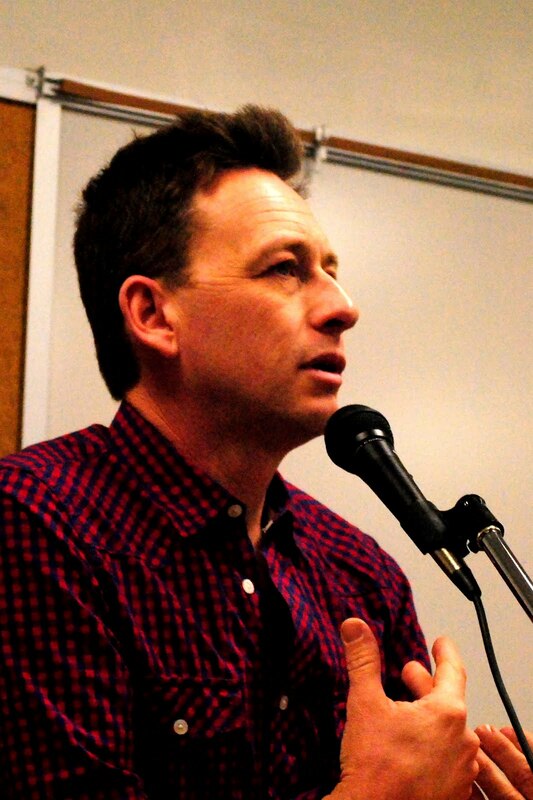 This year, our visiting author is Kentucky writer Silas House. Our classes read his more recent novel Clay's Quilt during fall semester, the story of a young boy who's father, a Vietnam vet, is suffering from PTSD. This semester, most of the classes read his first novel Clay's Quilt, not only a story of a young man growing into adulthood and finding love, but a story of the effects violent crime on a family--for years. House spoke at our Watauga campus yesterday and here on the Caldwell campus last night. His final appearance is set today at noon. He has, so far, charmed his audience with his easy-going, warm, and candid demeanor. I'll admit that hearing an author does not always make me fonder. Without naming names, I must say that sometimes ego or attitude can wreak havoc on my respect for an author. I may still love the writing, but I can sometimes see that the writer has perhaps gotten away from the vein of honesty and creativity I loved on the page. After all, writers are human beings. I'll usually give someone a second chance; some have blown that one too. I know that, like me, my students enjoy hearing something about how a book came into existence. We all need to be reminded that good writing is more a product of hard work and determination that pure talent or some kind of magic. For those of us who believe in the power of books, of words, it's always motivational to hear someone else's long, hard success story. Before House's visit, I not only read the two books we taught this semester, but I began to dig through my personal library, discovering some of his shorter fiction and his memoir writing in my favorite periodicals (Oxford American magazine, unquestionably at the top of my reading list), Christmas in the South, Blue Moon Cafe, and Don't Quit Your Day Job, Sonny Brewer's collection of stories of writers' jobs before the quit to write full time. I had heard Brewer at Nashville's Festival of the Book a couple of years ago with Brad Watson, Tom Franklin, and Rick Bragg. House's story tells of his job delivering the mail along a rural route, a time that allowed him to observe the people around him and time to think--writing thinking--eventually leading to the completion of Clay's Quilt. Today as we're anticipating his final appearance at noon, we're already thinking about whom to invite for next year's silver anniversary of the symposium, which books to share with our English and reading students next year. The list is tantalizing. M. T. Anderson's young adult novel Feed, published in 2002 is a dystopian novel that may hit a little too close to home. Titus, the protagonist, and his friends live in a future in which everyone (or everyone who can afford to do so) has an imbedded chip, called a "feed," transmitting conversations, news, and even commercials. Space travel is the norm in this world, where through innovations gravity, even nature, can be replicated. Early in the reading (or in my case, the listening), the characters' poor verbal skills, the profanity, and slang become annoying. Only with the introduction of Violet (homeschool by intellectual parents) demonstrates that language skills--indeed, personality traits--are shaped by the unbiquity of technology and the virtual absence of written text. In an all-too-creepy twist, since people are increasingly plagued by lesions on their bodies, these become popularized, and one of Titus's female friends has lesions engraved artificially on her body. The group of young people also learn that the Coca-Cola company will reward them with product if they pepper their conversational feeds with mentions of Coke (positive ones, that is). In some ways, this novel reminds me of a teen version of Gary Shteyngart's Super Sad True Love Story, in which the characters are also connected via something more like a small cell phone--but they are constantly monitored by the powers that be. In this story, Titus comes across as less-than-noble when Violet encourages him to rebel against authorities with her. His own insecurity and, perhaps, immaturity, keep him from behaving heroically through the story. While the audio version of a book often serves as a second best option, this audio actually mimics the feed, sounding like honest-to-goodness commercial interruptions, quite effective on CD. As disturbing as the story is, it reinforces at least one idea: a world where books are not valued is not a world where I want to live.